Cherry blossoms – cobblestone streets – horse-drawn carriages – art galleries – great food – what could be better? As you can probably tell, I thoroughly enjoyed attending the sketchbooking workshop at The Art League School. Although the class was geared more toward beginners, it was still useful to go through the basics of drawing again – seeing negative shapes, practicing perspective, and so forth. The best thing about the weekend (other than the glorious spring weather) was that I was focused completely on drawing and painting, with no other distractions. So – here are the results, in roughly chronological order. (The drawings were done in a Strathmore 5.5”x12” sketchbook; the paintings were done in an accordion-pleated sheet of watercolor paper provided by the instructor.) Click on each image to see it larger. Breakfast at Table Talk, a slice-of-Americana diner on Duke Street, was a hearty helping of eggs and potatoes. 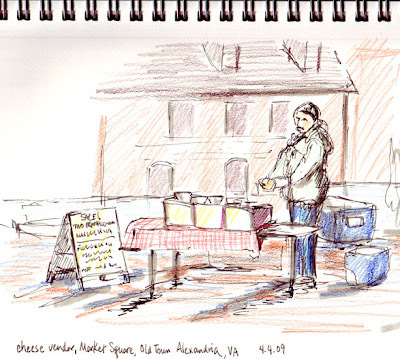 While waiting for the school to open, I stopped at the farmer’s market in Market Square on King Street and sketched a mozzarella vendor. After a morning of drawing exercises, we broke for lunch. A popular spot is the Firehook bakery on Union Street, with breads, sandwiches and pastries. Our final drawing assignment of the day – a series of drawings with a narrative, forming a cohesive, designed sketchbook page. 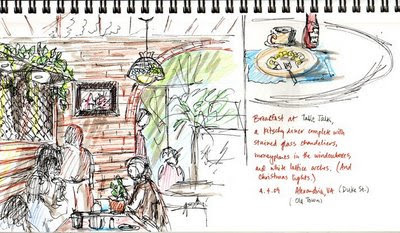 This time, we breakfasted at Bread & Chocolate, a European-style eatery on King Street. 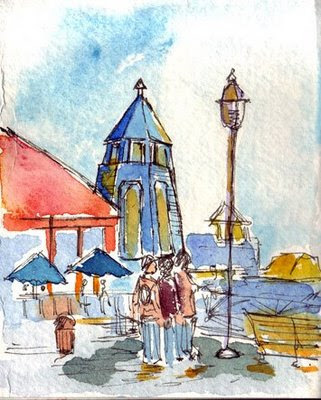 The morning was filled with more drawing and watercolor exercises – and then we were off to sketch outdoors. 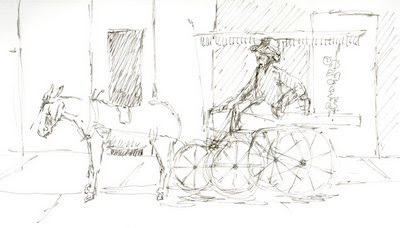 I warmed up with a quick sketch of this horse-drawn carriage as I ate lunch at Mai Thai near the water. 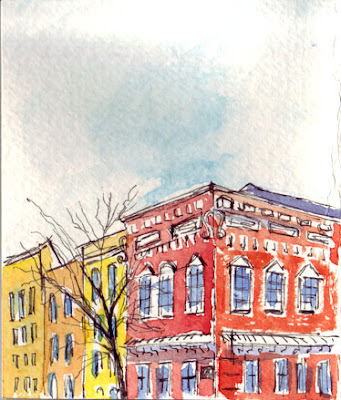 First, I tackled some buildings at the corner of King & Union Streets. I then took my folding stool to a little arcade by the waterfront. 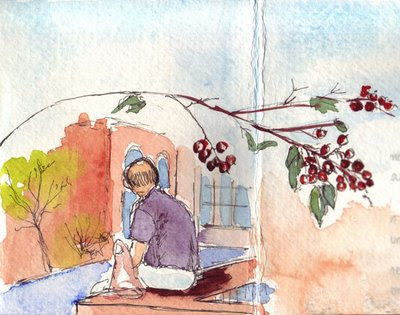 I started sketching the detail of this plant and thought that the guy eating lunch would fit into the picture, too. 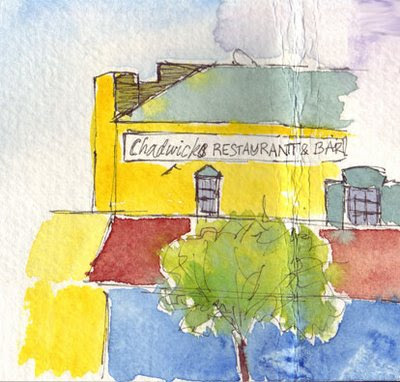 I had only a few minutes left, so I quickly drew the shapes of this popular hangout – I liked the boldness of the colors. Finally, I turned my attention to Prince Street, a cobblestone road right near the Art League School’s Duke Street Annex. 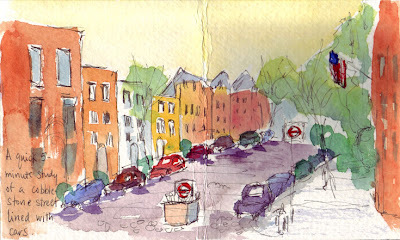 And that was my two days in Alexandria – can’t go wrong with sunshine and a sketchbook! This is the fun part of capturing a trip in sketches! Thanks for sharing. My best sketch book I created hjas been currently misplaced. I was in West Virginia on a job at a cook processing plant (coal type) for steel) and I captured the cranes and the steam and lights and then the early spring. It was fantastic and much better than a camera. I have total sketchbook envy! Next time I travel I swear I'll actually use real watercolors and actual perspective instead of my lazy watercolor pencil work.